'Vodu' means earthen in Kannada and Tulu language. Dosa is prepared in a concave shaped earthen vessel or tava. It will be spongy, soft and delicious too. Dosa will be cooked on one side. Because of concave shape centre part of the dosa will be thick and periphery will be thin. Those who don't have the earthen 'vodu' can try with nonstick pan as I did. In non stick pan the dosa will be uniformly thick. 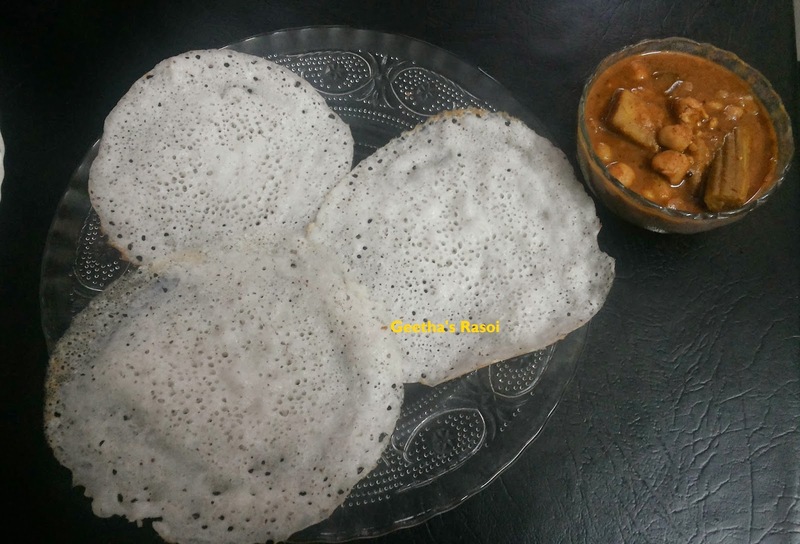 Try this vodu dosa and have a wonderful break fast!! !.To improve the taste dip the dosa few minutes in sweet coconut milk. The Konkani community call this as Surli Bhakri and it goes well any spicy curry, chutney or jaggery coconut milk. This batter does not need fermentation. Soak rice for 2 to 3 hours. Then wash and keep aside. Grind it with grated coconut, cooked boiled rice and washed raw rice into fine paste. And salt and water. Batter should be watery than normal dosa batter. Keep aside for 2 to 3 hours. Heat deep bottom earthen kadai pour batter on high flame, when u can see small holes then keep in medium flame, close lid and cook for 3 to 4 min. Tasty Vodu paale ready to serve with any types of curry or chutney.